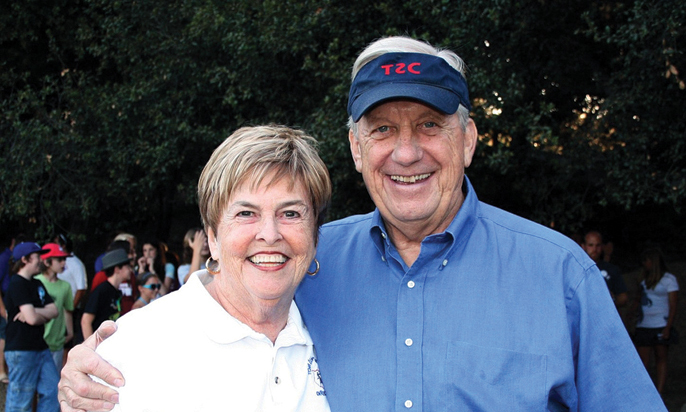 Sally and Mike Horner bought Tom Sawyer Camp in 1973 and have remained owners ever since. Nestled between the San Gabriel Mountains and San Rafael Hills in northwest Pasadena, Hahamongna Watershed Park represents one of the area’s last natural landscapes to remain unaltered by urbanization. The protected basin has not only fostered the development of several diverse ecologies, it also serves as home to the popular Tom Sawyer Camp, which this year is celebrating its 90th anniversary. What Tom Sawyer Camp has done for nearly a century is provide countless children with a variety of outdoor activities in safe and inclusive environments. 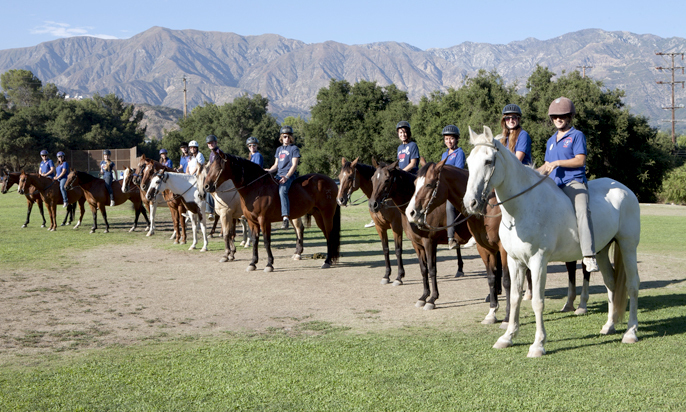 From horseback riding and archery to swimming and hiking, campers receive encouragement from a nurturing staff to seek adventure while disconnecting from an increasingly digital world. 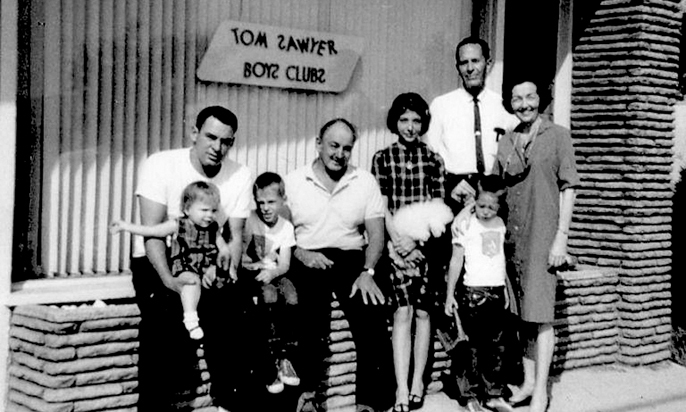 Bill Schleicher (center) and his family originally founded Tom Sawyer Camp in Laguna Beach in 1926. The success of Tom Sawyer Camp is a testament to the philosophy of its founder, Bill Schleicher. A first-generation American whose father emigrated from Europe and settled on a homestead in Idaho, Schleicher spent his youth in a rural setting, trapping on the rivers and exploring all that nature had to offer. 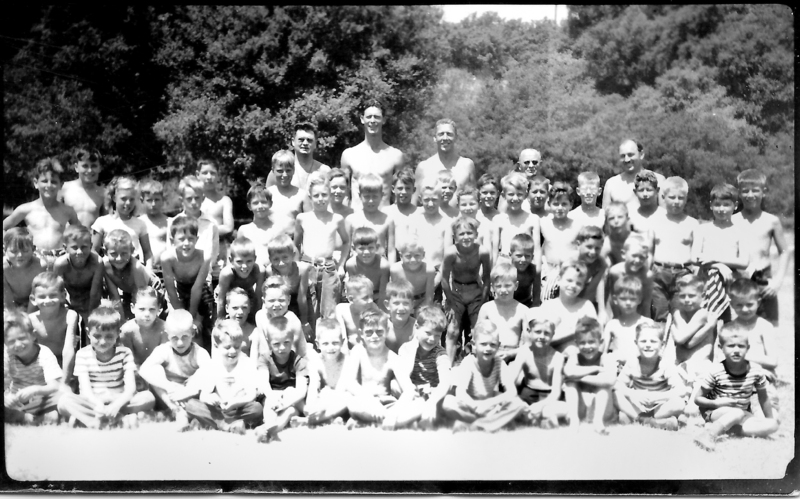 After the Schleichers moved to Southern California, Bill — with the help of his brother, Al — established an all-boys resident camp at Laguna Beach’s Bluebird Canyon in 1926. He named it Tom Sawyer Camp. Prior to the 1950s, Tom Sawyer Camp was an all-boys institution. “They just loved the outdoors and thought that city kids didn’t get a chance as they had been given to get out in the natural outdoors and get dirty and get in the water and experience nature,” said Kim Schleicher, Bill’s son who later owned the camp and served as its director from 1959-1973. In 1938, the Schleichers transferred the camp to Horseshoe Lake in Northern California. The rustic terrain of Shasta County provided Schleicher with a similar setting to his native Idaho, which he shared with campers such as Phil Swan. But government-imposed fuel rationing during World War II made it difficult to keep trekking up there, and so Tom Sawyer Camp was relocated again to Pasadena’s Arroyo, where it transitioned into a day camp. Two years later, in 1946, the camp settled in its current location at Hahamongna — which, back then, was known as Oak Grove Park. Mike Horner met Bill Schleicher in 1967 after moving across the country from Philadelphia to join a management consultant firm in Southern California. A friend introduced Horner to La Cañada Flintridge and suggested that he send his 6-year-old son, Tom, to nearby Tom Sawyer Camp. Horner soon became involved at the camp, using his professional experience to help sort out its finances and paperwork. 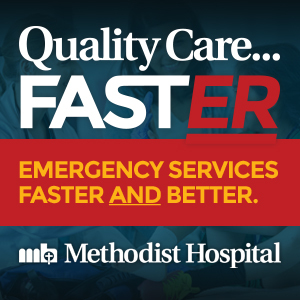 When Bill Schleicher suffered a fatal stroke in 1973, his son, Kim, decided to sell the camp but could not immediately find any buyers because of the organization’s deteriorating financial situation. It appeared that Tom Sawyer Camp was about to close its doors for good. That’s when Horner jumped in and bought the camp, determined to turn its fortunes around. Tom Sawyer Camp, which is celebrating its 90th anniversary this year, encourages campers to unplug and explore nature. Although Horner had run businesses before and wanted to try his hand again, he never thought that his next venture would be a camp. His only camp experience had consisted of the one he attended on an isolated island in Lake Erie as a young boy. But Horner marched ahead and asked his wife, Sally, to manage the office during his second year as owner. Within a year, she assumed the role of executive director and held the position for the next 30 years — until she was succeeded by her daughter Sarah Horner Fish. Along the way, Sally Horner forged valuable partnerships with the American Camp Association and Western Association of Independent Camps. 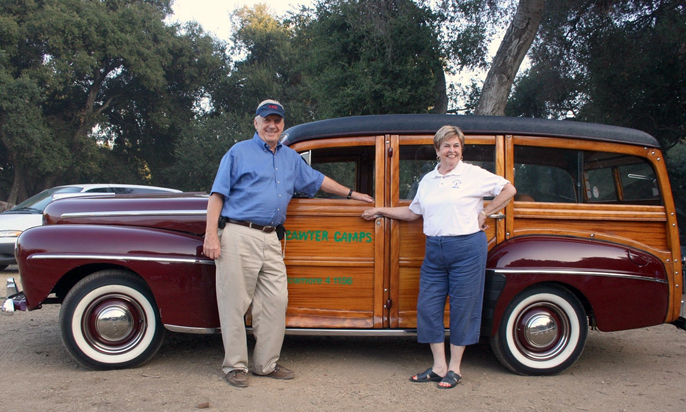 Mike and Sally Horner have been running Tom Sawyer Camp for more than 40 years at Hahamongna Watershed Park in Pasadena. Throughout the years, Tom Sawyer Camp has enhanced its summer program to include a wide range of options for both boys and girls — who were first able to enroll in the 1950s. 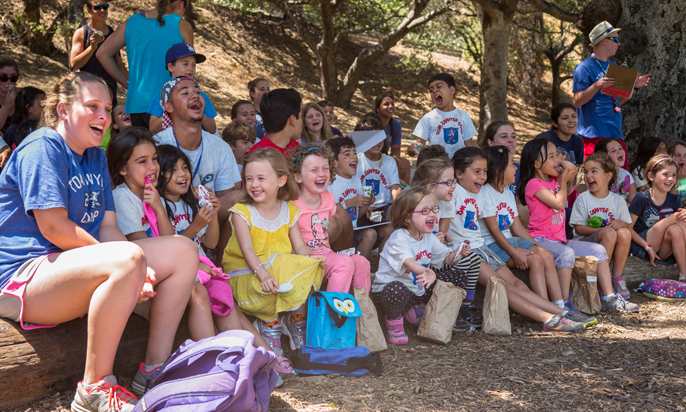 Pre-Camp is meant to teach preschool-age children about sharing outdoor adventures without the restrictions of fences, noise levels or clean clothes. “Camp is a very powerful tool in youth development. People have anecdotally known that for more than 150 years from when the first camps were started in New England. Today, as kids don’t go out into nature as much, camp is more important than ever to have that experience,” said Tom Horner, part owner of Tom Sawyer Camp, who has been involved in some capacity — either as a camper, counselor or director — every year since his father bought the camp from Schleicher in the early ’70s. Horseback riding, archery, swimming and hiking are some of the activities that Tom Sawyer Camp offers each year. The popular Tom Sawyer-Becky Thatcher Day Camp program provides 1st- through 6th-graders with opportunities to ride horses, go for a swim and explore nature, among many alternative adventures. A senior counselor and junior counselor lead either an all-boys or all-girls group of 13, which has been divided by grade level. 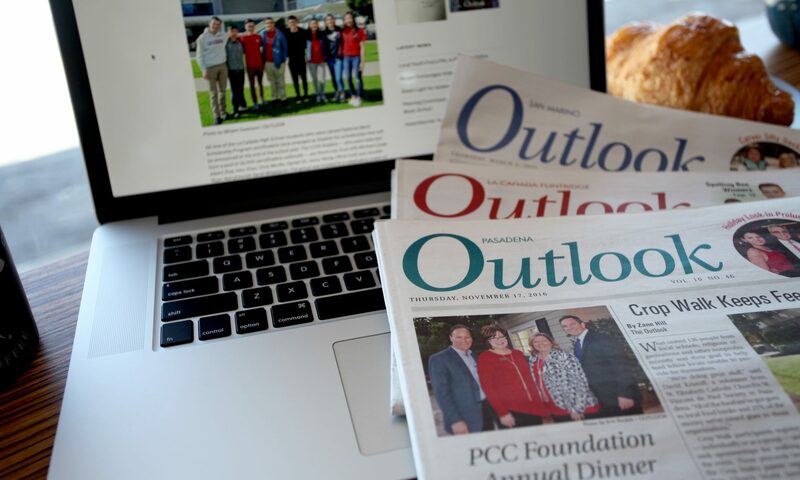 For 6th- through 9th-graders, Outpost is Tom Sawyer Camp’s challenging adventure program designed to present a more rugged and varied approach. Outpost campers supplement the traditional day camp offerings with rock climbing, windsurfing and a ropes course taught by staff at local sites. Anna Wohl followed what has become known as the camper career path. She began as a member of Pre-Camp at age 3, then progressed through each stage of camp before becoming a junior counselor, assistant counselor and eventually a senior counselor. Tom Horner, Sarah Horner Fish and Mike Horner with one of the recognizable vans with the backward “S” that have become a defining aspect of the camp. 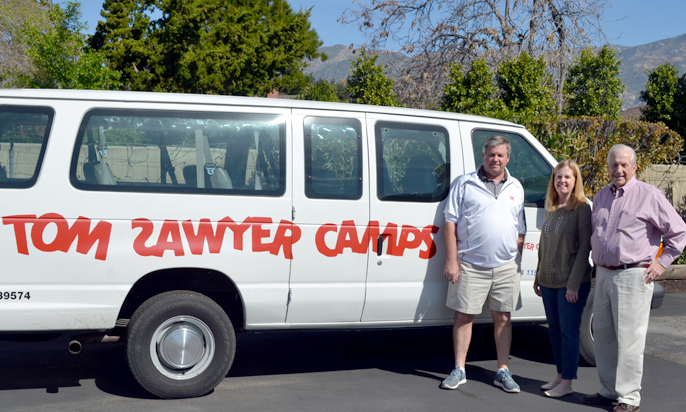 When the Horner family bought Tom Sawyer Camp in 1973, there were a little more than 100 campers and 10 vans on the books. Those numbers have since jumped to 500 campers per day, 45 vans, 130 paid staff members and 60 volunteers, as the local institution has not only survived but thrived. This family business model has also spearheaded the addition of several after-school programs that augment the traditional summer options. As Tom Sawyer Camp looks toward an even brighter future, those who have been so instrumental in maintaining its success can’t help but reflect on how far Schleicher’s original vision has come during the past 90 years. 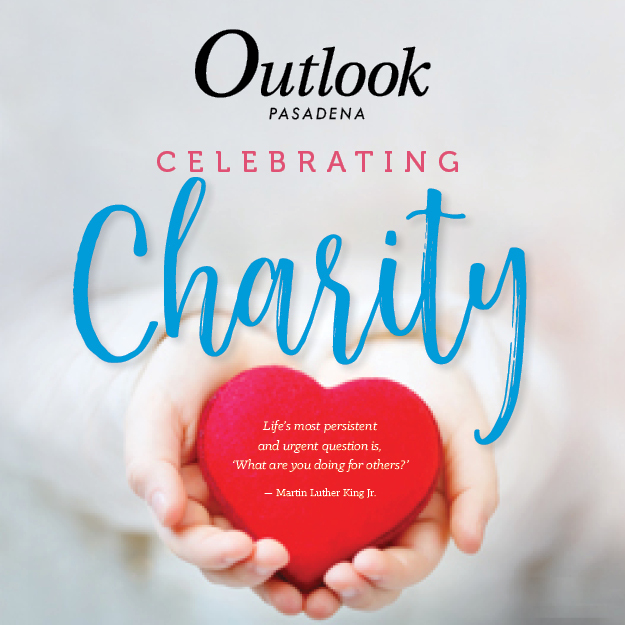 “I like to think about how many generations of children’s lives we have impacted, how many kids have developed and grown skills because of their time at camp,” said Horner Fish.